Erected in loving memory of. Alexander Sinclair, farmer of Rangag died November 1837 aged 67. Wife Janet Campbell died at Houstry 28th October 1876 aged 88. Daughter Barbara Sinclair died June 1866 aged 50. Daughter Elizabeth Sinclair died 2nd March 1909 aged 94. 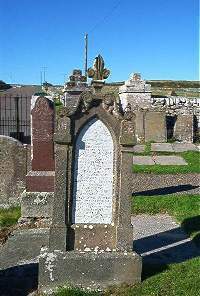 Son James Sinclair died 6th Febuary 1894 aged 80. Grandchildren Jessie and Alexander Sinclair died in infancy.